The motion of a spinning object in a force field is quite complicated. In our post on gyroscopes, we introduced the concepts of precession and nutation. 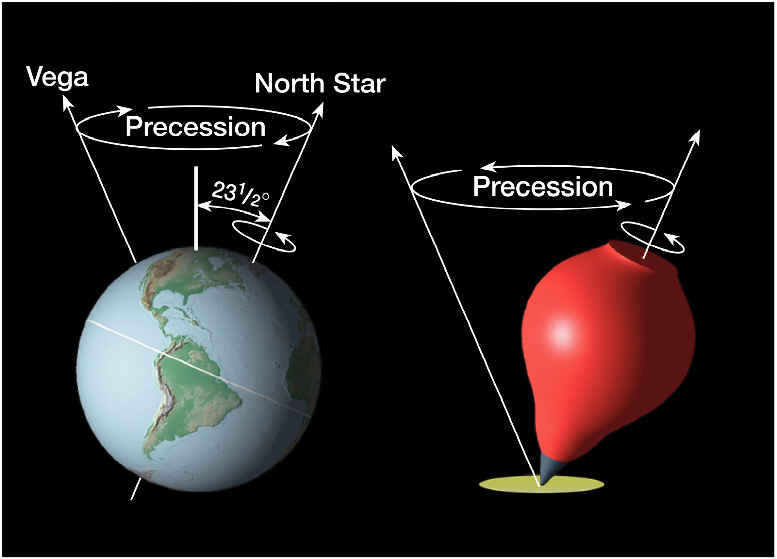 The concept of precession is illustrated below for the Earth as well as for a spinning top. In both cases, the external force is just gravity. 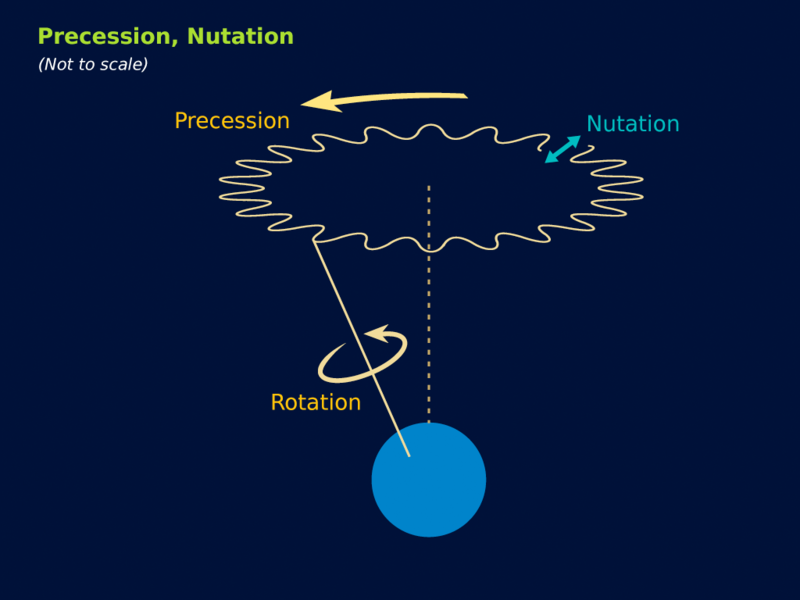 Nutation is an additional movement: on top of the precessional movement, a spinning object may wobble, as illustrated below. There seems to be no analog for nutation in quantum mechanics. In fact, the terms nutation and precession seem to be used interchangeably in quantum physics, although they are very different in classical physics. But let’s not complicate things and, hence, talk about the phenomenon of precession only. We will not re-explain the phenomenon of precession here but just remind you that the phenomenon can be described in terms of (a) the angle between the symmetry axis and the momentum vector, which we’ll denote by θ, and (b) the angular velocity of the precession, which we’ll denote by ωp = dφ/dt, as shown below. The J in the illustration below is the angular momentum of the object. Hence, if we’d imagine it to be an electron, then J would be the spin angular momentum only, not its orbital angular momentum—although the analysis would obviously be valid for the orbital and/or total angular momentum as well. This is a number expressed per unit of the magnetic field strength B. Note that you’ll often see this number expressed as 1.4 megacycles per gauss, using the older gauss unit for magnetic field strength: 1 tesla = 10,000 gauss. For a nucleus, we get a somewhat less impressive number because the proton (or neutron) mass is so much bigger: it’s a number expressed in megacycles per tesla, indeed, and for a proton (i.e. a hydrogen nucleus), it’s about 42.58 MHz/T. At this point, you may wonder if and why all of the above is relevant. Well… There’s more than one answer to this question, but I’d recommend you start with reading the Wikipedia article on NMR spectroscopy. 🙂 And then you should also read Feynman’s exposé on the Rabi atomic or molecular beam method for determining the precession frequency. It’s really fascinating stuff, but you are sufficiently armed now to read those things for yourself, and so I’ll just move on. Indeed, there’s something else I need to talk about here, and that’s Larmor’s Theorem. I guess it’s about time we relate all of what we learned so far to properties of matter we can relate to, and so that’s what I’ll do here. We’re not going to talk about ferromagnetism here, i.e. the mechanism through which iron, nickel and cobalt and most of their alloys become permanent magnets. That’s quite peculiar and so we will not discuss it here. Here we’ll talk about the very weak quantum-mechanical magnetic effect – a thousand to a million times less than the effects in ferromagnetic materials – that occurs in all materials when placed in an external magnetic field. While the effect is there in all materials, it’s stronger for some than for others. In fact, it’s usually so weak it is hard to detect, and so it’s usually demonstrated using elements for which the diamagnetic effect is somewhat stronger, like bismuth or antimony. The effect is demonstrated by suspending a piece of material in a non-uniform field, as illustrated below. The diamagnetic effect will cause a small displacement of the material, away from the high-field region, i.e. away from the pointed pole. I should immediately add that some materials, like aluminium, will actually be attracted to the pointed pole, but that’s because of yet another effect that not all materials share: paramagnetism. I’ll talk about that in another post, together with ferromagnetism. So… Diamagnetism: what is it? The illustration below shows our spinning electron (q) once again. It also shows a magnetic field B but, unlike our analysis above, or the analysis in our previous post, we assume the external magnetic field is not just there. We assume it changes, because it’s been turned on or off—hopefully slowly: if not, we’d have eddy-current forces causing potentially strong impulses. This is very interesting indeed. This classical theorem basically says that the energy of a system should not be affected by the presence of a magnetic field. However, we know magnetic effects, such as the diamagnetic effect, are there, so these effects are referred to as ‘quantum-mechanical’ effects indeed: they cannot be explained using classical theory only, even if all of what we wrote above used classical theory only. I should also note another point: why do we need a non-homogeneous field? Well… The situation is comparable to what we wrote on the Stern-Gerlach experiment. If we would have a homogeneous magnetic field, then we would only have a torque on all of the atomic magnets, but no net force in one or the other direction. There’s something else here too: you may think that the forces pointing towards and away from the pointed tip should cancel each other out, so there should actually be no net movement of the material at all! Feynman’s analysis works for one atom, indeed, but does it still make sense if we look at the whole piece of material? It does, because we’re talking an induced magnetic moment that’s opposing the field, regardless of the orientation of the magnetic moment of the individual atoms in the piece of material. So, even if the individual atoms have opposite momenta, the extra induced magnetic moment will point in the same direction for all. So that solves that issue. However, it does not address Feynman’s own critical remark in regard to the supposed ‘impossibility’ of diamagnetism in classical mechanics. But I’ll let you think about this, and sign off for today. 🙂 I hope you enjoyed this post. Note: A few years after writing the post below, I published a paper on the anomalous magnetic moment which makes (some of) what is written below irrelevant. It gives a clean classical explanation for it. Have a look by clicking on the link here ! When discussing electromagnetic radiation, we introduced the concept of atomic oscillators. It was a very useful model to help us understand what’s supposed to be going on. Now we’re going to introduce atomic magnets. It is based on the classical idea of an electron orbiting around a proton. Of course, we know this classical idea is wrong: we don’t have nice circular electron orbitals, and our discussion on the radius of an the electron in our previous post makes it clear that the idea of the electron itself is rather fuzzy. Nevertheless, the classical concepts used to analyze rotation are also used, mutatis mutandis, in quantum mechanics. Mutatis mutandis means: with necessary alterations. So… Well… Let’s go for it. 🙂 The basic idea is the following: an electron in a circular orbit is a circular current and, hence, it causes a magnetic field, i.e. a magnetic flux through the area of the loop—as illustrated below. As such, we’ll have a magnetic (dipole) moment, and you may want to review my post(s) on that topic so as to ensure you understand what follows. The magnetic moment (μ) is the product of the current (I) and the area of the loop (π·r2), and its conventional direction is given by the μ vector in the illustration below, which also shows the other relevant scalar and/or vector quantities, such as the velocity v and the orbital angular momentum J. The orbital angular momentum is to be distinguished from the spin angular momentum, which results from the spin around its own axis. So the spin angular momentum – which is often referred to as the spin tout court – is not depicted below, and will only be discussed in a few minutes. The L vector is moving around, so that assumes the orbital plane is moving around too. That happens when we’d put our atomic system in a magnetic field. We’ll come back to that. In what follows, we’ll assume the orbital plane is not moving. The S vector here is also moving, which also assumes the axis of rotation is not steady. What’s going on here is referred to as precession, and we discussed it when presenting the math one needs to understand gyroscopes. Adding S and L yields J, the total angular momentum. Unsurprisingly, this vector wiggles around too. Don’t worry about the magnitudes of the vectors here. Also, in case you’d wonder why the axis of symmetry for the movement of the J vector happens to be the Jz axis, the answer is simple: we chose the coordinate system so as to ensure that was the case. But I am digressing. I just inserted the illustration above to give you an inkling of where we’re going with this. Indeed, what’s shown above will make it easier for you to see how we can generalize the analysis that we’ll do now, which is an analysis of the orbital angular momentum and the related magnetic moment only. Let me copy the illustration we started with once more, so you don’t have to scroll up to see what we’re talking about. So we have a charge orbiting around some center. It’s a classical analysis, and so it’s really like a planet around the Sun, except that we should remember that likes repel, and opposites attract, so we’ve got a minus sign in the force law here. Let’s go through the math. The magnetic moment is the current times the area of the loop. As the velocity is constant, the current is just the charge q times the frequency of rotation. The frequency of rotation is, of course, the velocity (i.e. the distance traveled per second) divided by the circumference of the orbit (i.e. 2π·r). Hence, we write: I = (qe·v)/(2π·r) and, therefore: μ = (qe/·v)·π·r2)/(2π·r) = qe·v·r/2. Note that, as per the convention, current is defined as a flow of positive charges, so the illustration above actually assumes we’re talking some proton in orbit, so q = qe would be the elementary charge +1. If we’d be talking an electron, then its charge is to be denoted as –qe (minus qe, i.e. −1), and we’d need to reverse the direction of μ, which we’ll do in a moment. However, to simplify the discussion, you should just think of some positive charge orbiting the way it does in the illustration above. OK. That’s all there’s to say about the magnetic moment—for the time being, that is. Let’s think about the angular momentum now. It’s orbital angular momentum here, and so that’s the type of angular momentum we discussed in our post on gyroscopes. We denoted it as L indeed – i.e. not as J, but that’s just a matter of conventions – and we noted that L could be calculated as the vector cross product of the position vector r and the momentum vector p, as shown in the animation below, which also shows the torque vector τ. The angular momentum L changes in the animation above. In our J case above, it doesn’t. Also, unlike what’s happening with the angular momentum of that swinging ball above, the magnitude of our J doesn’t change. It remains constant, and it’s equal to |J| = J = |r×p| = |r|·|p|·sinθ = r·p = r·m·v. One should note this is a non-relativistic formula, but as the relative velocity of an electron v/c is equal to the fine-structure constant, so that’s α ≈ 0.0073 (see my post on the fine-structure constant if you wonder where this formula comes from), it’s OK to not include the Lorentz factor in our formulas as for now. In other words, the ratio of the magnetic moment and the angular moment depends on (1) the charge (q) and (2) the mass of the charge, and on those two variables only. So the ratio does not depend on the velocity v nor on the radius r. It can be noted that the q/2m factor is often referred to as the gyromagnetic factor (not to be confused with the g-factor, which we’ll introduce shortly). It’s good to do a quick dimensional check of this relation: the magnetic moment is expressed in ampère per second times the loop area, so that’s (C/s)·m2. On the right-hand side, we have the dimension of the gyromagnetic factor, which is C/kg, times the dimension of the angular momentum, which is m·kg·m/s, so we have the same units on both sides: C·m2/s, which is often written as joule per tesla (J/T): the joule is the energy unit (1 J = 1 N·m), and the tesla measures the strength of the magnetic field (1 T = 1 (N·s)/(C·m). OK. So that works out. This formula says that the μ/J ratio is twice what it is for the orbital motion of the electron. Why is that? Feynman says “the reasons are pure quantum-mechanical—there is no classical explanation.” So I’d suggest we just leave that question open for the moment and see if we’re any wiser once we’ve worked ourselves through all of his Lectures on quantum physics. 🙂 Let’s just go along with it as for now. Why the minus sign? Well… I wanted to get the sign right this time. Our model assumed some positive charge in orbit, but so we want a formula for a atomic system, and so our circling charge should be an electron. So the formula above is the formula for a electron, and the direction of the magnetic moment and of the angular motion will be opposite for electrons: it just replaces q by –qe. The format above also applies to any atomic system: as Feynman writes, “For an isolated atom, the direction of the magnetic moment will always be exactly opposite to the direction of the angular momentum.” So the g-factor will be characteristic of the state of the atom. It will be 1 for a pure orbital moment, 2 for a pure spin moment, or some other number in-between for a complicated system like an atom, indeed. You may have one last question: why qe/2m instead of qe/m in the middle? Well… If we’d take qe/m, then g would be 1/2 for the orbital angular momentum, and the initial idea with g was that it would be some integer (we’ll quickly see that’s an idea only). So… Well… It’s just one more convention. Of course, conventions are not always respected so sometimes you’ll see the expression above written without the minus sign, so you may see it as μ = g·(qe/2me)·J. In that case, the g-factor for our example involving the spin angular momentum and the spin magnetic moment, will obviously have to be written as minus 2. OK. That’s clear enough. For electrons, the g-factor is referred to as the Landé g-factor, while the g-factor for protons or, more generally, for any spinning nucleus, is referred to as the nuclear g-factor. Now, you may or may not be surprised, but there’s a g-factor for neutrons too, despite the fact that they do not carry a net charge: the explanation for it must have something to do with the quarks that make up the neutron but that’s a complicated matter which we will not get into here. Finally, there is a g-factor for a whole atom, or a whole atomic system, and that’s referred to as… Well… Just the g-factor. 🙂 It’s, obviously, a number that’s characteristic of the state of the atom. Let’s now move on to the next topic. Of course, we’re talking quantum mechanics and, therefore, J can only take on a finite number of values. While that’s weird – as weird as other quantum-mechanical things, such as the boson-fermion math, for example – it should not surprise us. As we will see in a moment, the values of J will determine the magnetic energy our system will acquire when we put in some magnetic field and, as Feynman writes: “That the energy of an atom in the magnetic field can have only certain discrete energies is really not more surprising than the fact that atoms in general have only certain discrete energy levels. Why should the same thing not hold for atoms in a magnetic field? It does. It is just correlation of this with the idea of an oriented magnetic moment that brings out some of the strange implications of quantum mechanics.” Yep. That’s true. We’ll talk about that later. Of course, you’ll probably want some ‘easier’ explanation. I am afraid I can’t give you that. All I can say is that, perhaps, you should think of our discussion on the fine-structure constant, which made it clear that the various radii of the electron, its velocity and its mass and/or energy are all related one to another and, hence, that they can only take on certain values. Indeed, of all the relations we discussed, there’s two you should always remember. The first relationship is the U = (e2/r) = α/r. So that links the energy (which we can express in equivalent mass units), the electron charge and its radius. The second thing you should remember is that the Bohr radius and the classical electron radius are also related through α: α re/r = α2. So you may want to think of the different values for J as being associated with different ‘orbitals’, so to speak. But that’s a very crude way of thinking about it, so I’d say: just accept the fact and see where it leads us. You’ll see, in a few moments from now, that the whole thing is not unlike the quantum-mechanical explanation of the blackbody radiation problem, which assumes that the permitted energy levels (or states) are equally spaced and h·f apart, with f the frequency of the light that’s being absorbed and/or emitted. So the atom takes up energies only h·f at a time. Here we’ve got something similar: the energy levels that we’ll associate with the discrete values of J – or J‘s components , I should say – will also be equally spaced. Let me show you how it works, as that will make things somewhat more clear. Note that we will always have 2j + 1 values. For example, if j = 3/2, we’ll have 2·(3/2) + 1 = 4 permitted values, and in the extreme case where j is zero, we’ll still have 2·0 + 1 = 1 permitted value: zero itself. So that basically says we have no angular momentum. […] OK. That should be clear enough, but let’s pause here for a moment and analyze this—just to make sure we ‘get’ this indeed. What’s being written here? What are those numbers? Let’s do a quick dimensional analysis first. Because j, j − 1, j − 2, etcetera are pure numbers, it’s only the dimension of ħ that we need to look at. We know ħ: it’s the Planck constant h, which is expressed in joule·second, i.e. 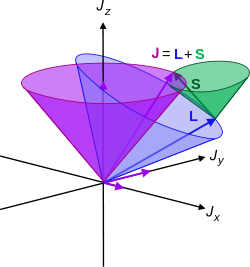 J·s = N·m·s, divided by 2π. That makes sense, because we get the same dimension for the angular momentum. Indeed, the L or J = r·m·v formula also gives us the dimension of physical action, i.e. N·m·s. Just check it: [r]·[m]·[v] = m·kg·m/s = m·(N·s2/m)·m/s = N·m·s. Done! So we’ve got some kind of unit of action once more here, even if it’s not h but ħ = h/2π. That makes it a quantum of action expressed for a radian, so that’s a unit of length, rather than for a full cycle. Just so you know, ħ = h/2π is 1×10−34 J·s ≈ 6.6×10−16 eV·s, and we could chose to express the components of J in terms of h by multiplying the whole thing with 2π. That would boil down to saying that our unit length is not unity but the unit circle, which is 2π times unity. Huh? Just think about it: h is a fundamental unit linked to one full cycle of something, so it all makes sense. Before we move on, you may want to compare the value of h or ħ with the energy of a photon, which is 1.6 to 3.2 eV in the visible light spectrum, but you should note that energy does not have the time dimension, and a second is an eternity in quantum physics, so the comparison is a bit tricky. So… […] Well… Let’s just move on. What about those coefficients? What constraints are there? A lithium (Li-7) nucleus has spin j = 3/2 and, therefore, the permitted values for the angular momentum around any axis (the z-axis, for example) are: 3/2, 3/2−1=1/2, 3/2−2=−1/2, and −3/2—all times ħ of course! Note that the difference between +j and –j is 3, and each ‘step’ between those two levels is ħ, as we’d like it to be. An electron is a spin-1/2 particle, and so there are only two permitted values: +ħ/2 and −ħ/2. So there is just one ‘step’ and it’s equal to the whole difference between +j and –j. In fact, this is the most common situation, because we’ll be talking elementary fermions most of the time. Photons are an example of spin-1 ‘particles’, and ‘particles’ with integer spin are referred to as bosons. In this regard, you may heard of superfluid Helium-4, which is caused by Bose-Einstein condensation near the zero temperature point, and demonstrates the integer spin number of Helium-4, so it resembles Lithium-6 in this regard. The four ‘typical’ examples makes it clear that the actual situations that we’ll be analyzing will usually be quite simple: we’ll only have 2, 3 or 4 permitted values only. As mentioned, there is this fundamental dichotomy between fermions and bosons. Fermions have half-integer spin, and all elementary fermions, such as protons, neutrons, electrons, neutrinos and quarks are spin-1/2 particles. [Note that a proton and a neutron are, strictly speaking, not elementary, as their constituent parts are quarks.] Bosons have integer spin, and the bosons we know of are spin-one particles, (except for the newly discovered Higgs boson, which is an actual spin-zero particle). The photon is an example, but the helium nucleus (He-4) also has spin one, which – as mentioned above – gives rise to superfluidity when its cooled near the absolute zero point. In any case, to make a long story short, in practice, we’ll be dealing almost exclusively with spin-1, spin-1/2 particles and, occasionally, with spin-3/2 particles. In addition, to analyze simple stuff, we’ll often pretend particles do not have any spin, so our ‘theoretical’ particles will often be spin zero. That’s just to simplify stuff. We now need to learn how to do a bit of math with all of this. Before we do so, let me make some additional remarks on these permitted values. Regardless of whether or not J is ‘wobbling’ or moving or not – let me be clear: J is not moving in the analysis above, but we’ll discuss the phenomenon of precession in the next post, and that will involve a J like that J circling around the Jz axis, so I am just preparing the terrain here – J‘s magnitude will always be some constant, which we denoted by |J| = J. Now there’s something really interesting here, which again distinguishes classical mechanics from quantum mechanics. As mentioned, in classical mechanics, any of J‘s components Jx, Jy or Jz, could take on any value from +J to −J and, therefore, the maximum value of any component of J – say Jz – would be equal to J. To be precise, J would be the value of the component of J in the direction of J itself. So, in classical mechanics, we’d write: |J| = +√(J·J) = +√J2 = J, and it would be the maximum value of any component of J. But so we said that, if the spin number of J is j, then the maximum value of any component of J was equal to j·ħ. So, naturally, one would think that J = |J| = +√(J·J) = +√J2 = j·ħ. However, that’s not the case in quantum mechanics: the maximum value of any component of J is not J = j·ħ but the square root of j·(j+1)·ħ. J‘s magnitude is not jħ but √(j(j+1)ħ). The formula can be easily generalized for j ≠ 3/2. Also note that we used a fact that we didn’t mention as yet: all possible values of the z-component (or of whatever component) of J are equally likely. From what we have so far, we can get another interesting and somewhat surprising conclusion. In certain classical calculations the quantity that appears in the final result is the square of the magnitude of the angular momentum J—in other words, J⋅J = J2. It turns out that it is often possible to guess at the correct quantum-mechanical formula by using the classical calculation and the following simple rule: Replace J2 = J⋅J by j(j+1)ħ. This rule is commonly used, and usually gives the correct result. 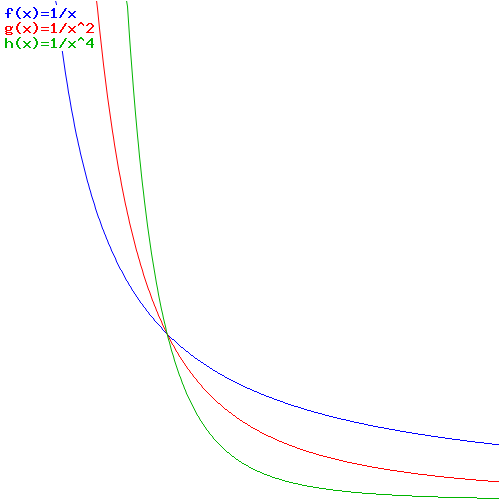 The second implication is the one we announced already: although we would think classically that the largest possible value of the any component of J is just the magnitude of J, quantum-mechanically the maximum of any component of J is always less than that, because jħ is always less than √(j(j+1)ħ). For example, for j = 3/2 = 1.5, we have j(j+1) = (3/2)·(5/2) = 15/4 = 3.75. 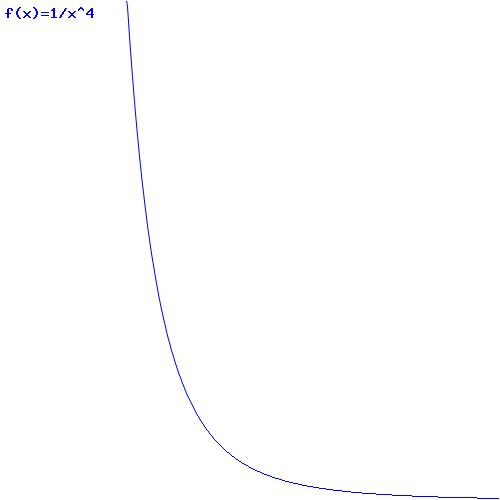 Now, the square root of this value is √3.75 ≈ 1.9365, so the magnitude of J is about 30% larger than the maximum value of any of J‘s components. That’s a pretty spectacular difference, obviously! The second point is quite deep: it implies that the angular momentum is ‘never completely along any direction’. Why? Well… Think of it: “any of J‘s components” also includes the component in the direction of J itself! But if the maximum value of that component is 30% less than the magnitude of J, what does that mean really? All we can say is that it implies that the concept of the direction of the magnitude itself is actually quite fuzzy in quantum mechanics! Of course, that’s got to do with the Uncertainty Principle, and so we’ll come back to this later. In fact, if you look at the math, you may think: what’s that business with those average or expected values? A magnitude is a magnitude, isn’t it? It’s supposed to be calculated from the actual values of Jx, Jy and Jz, not from some average that’s based on the (equal) likelihoods of the permitted values. You’re right. Feynman’s derivation here is quantum-mechanical from the start and, therefore, we get a quantum-mechanical result indeed: the magnitude of J is calculated as the magnitude of a quantum-mechanical variable in the derivation above, not as the magnitude of a classical variable. […] OK. On to the next. Before we start talking about this topic, we should, perhaps, relate the angular momentum to the magnetic moment once again. We can do that using the μ = (q/2m)·J and/or μ = (q/m)·J formula (so that’s the simple formulas for the orbital and spin angular momentum respectively) or, else, by using the more general μ = – g·(q/2m)·J formula. Let’s use the simpler μ = (qe/2m)·J formula, which is the one for the orbital angular momentum. What’s qe/2m? It should be equal to 1.6×10−19 C divided by 2·9.1×10−31 kg, so that’s about 0.0879×1012 C/kg, or 0.0879×1012 (C·m)/(N·s2). Now we multiply by ħ/2 ≈ 0.527×10−34 J·s. We get something like 0.0463×10−22 m2·C/s or J/T. These numbers are ridiculously small, so they’re usually measured in terms of a so-called natural unit: the Bohr magneton, which I’ll explain in a moment but so here we’re interested in its value only, which is μB = 9.274×10−24 J/T. Hence, μ/μB = 0.5 = 1/2. What a nice number! Hmm… This cannot be a coincidence… […] You’re right. It isn’t. To get the full picture, we need to include the spin angular momentum, so we also need to see what the μ = (q/m)·J will yield. That’s easy, of course, as it’s twice the value of (q/2m)·J, so μ/μB = 1, and so the total is equal to 3/2. So the magnetic moment of an electron has the same value (when expressed in terms of the Bohr magneton) as the spin (when expressed in terms of ħ). Now that’s just sweet! Hmm…. The accuracy of the measurement suggests we should take it seriously, even if we’re talking a difference of 0.1% only. We should. It can be explained, of course: it’s something quantum-mechanical. However, we’ll talk about this later. As for now, just try to understand the basics here. It’s complicated enough already, and so we’ll stay away from the nitty-gritty as long as we can. I won’t explain the whole thing once again, but it might help to visualize the situation, which we do below. The loop here is not circular but square, and it’s a current-carrying wire instead of an electron in orbit, but I hope you get the point. The graph above becomes the graph below, and we can now speak more loosely and say that the electron either has its spin ‘up’ (so that’s along the field), or ‘down’ (so that’s opposite the field). By now, you’re probably tired of the math and you’ll wonder: how can we prove all of this permitted value business? Well… That question leads me to the last topic of my post: the Stern-Gerlach experiment. Stern and Gerlach made their magnet with a very sharp edge on one of the pole tips in order to produce a very rapid variation of the magnetic field. The beam of silver atoms was directed right along this sharp edge, so that the atoms would feel a vertical force in the inhomogeneous field. A silver atom with its magnetic moment directed horizontally would have no force on it and would go straight past the magnet. An atom whose magnetic moment was exactly vertical would have a force pulling it up toward the sharp edge of the magnet. An atom whose magnetic moment was pointed downward would feel a downward push. Thus, as they left the magnet, the atoms would be spread out according to their vertical components of magnetic moment. In the classical theory all angles are possible, so that when the silver atoms are collected by deposition on a glass plate, one should expect a smear of silver along a vertical line. The height of the line would be proportional to the magnitude of the magnetic moment. The abject failure of classical ideas was completely revealed when Stern and Gerlach saw what actually happened. They found on the glass plate two distinct spots. The silver atoms had formed two beams. I should note one point which Feynman hardly addresses in the analysis above: why do we need a non-homogeneous field? Well… Think of it. The individual silver atoms are not like electrons in some electric field. They are tiny little magnets, and magnets do not behave like electrons. Remember we said there’s no such thing as a magnetic charge? So that applies here. If the silver atoms are tiny magnets, with a magnetic dipole moment, then the only thing they will do is turn, so as to minimize their energy U = −μBcosθ. That energy is minimized when μ and B are at right angles of each other, so as to make the cosθ factor zero, which happens when θ = π/2. Hence, in a homogeneous magnetic field, we will have a torque on the loop of current – think of our electron(s) in orbit here – but no net force pulling it in this or that direction as a whole. So the atoms would just rotate but not move in our classical analysis here. To make the atoms themselves move towards or away one of the poles (with or without a sharp tip), the magnetic field must be non-homogeneous, so as to ensure that the force that’s pulling on one side of the loop of current is slightly different from the force that’s pulling (in the opposite direction) on the other side of the loop of current. So that’s why the field has to be non-homogeneous (or inhomogeneous as Feynman calls it), and so that’s why one pole needs to have a sharply pointed tip. As for the force formula, it’s crucial to remember that energy (or work) is force times distance. To be precise, it’s the ∫F∙ds integral. This integral will have a minus sign in front when we’re doing work against the force, so that’s when we’re increasing the potential energy of an object. Conversely, we’ll just take the positive value when we’re converting potential energy into kinetic energy. So that explains the F = −∂U/∂z formula above. In fact, in the analysis above, Feynman assumes the magnetic moment doesn’t turn at all. That’s pretty obvious from the Fz = −∂U/∂z = −μ∙cosθ∙∂B/∂z formula, in which μ is clearly being treated as a constant. So the Fz in this formula is a net force in the z-direction, and it’s crucially dependent on the variation of the magnetic field in the z-direction. If the field would not be varying, ∂B/∂z would be zero and, therefore, we would not have any net force in the z-direction. As mentioned above, we would only have a torque. Well… This sort of covers all of what we wanted to cover today. 🙂 I hope you enjoyed it. In my previous post, I explained why the fine-structure constant α is not a ‘magical’ number, even if it relates all fundamental properties of the electron: its mass, its energy, its charge, its radius, its photon scattering cross-section (i.e. the Bohr radius, or the size of the atom really) and, finally, the coupling constant for photon-electron interactions. The key to such understanding of α was the model of an electron as a tiny ball of charge. As such, we have two energy formulas for it. One is the energy that’s needed to assemble the charge from infinitely dispersed infinitesimal charges, which we denoted as Uelec. The other formula is the energy of the field of the tiny ball of charge, which we denoted as Eelec. Eelec = (2/3)·(e2/a): This is the formula for the energy of the field, so we may all it is external energy. Uelec = (3/5)·(e2/a), or Uelec = (1/2)·(e2/a): This is the energy needed to assemble our electron, so we might, perhaps, call it its internal energy. The first formula assumes our electron is a uniformly charged sphere. The second assumes all charges sit on the surface of the sphere. If we drop the assumption of the charge having to be uniformly distributed, we’ll find yet another formula. mec2 = e2/r0: This is the energy associated with the so-called classical electron radius (r0) and the electron’s rest mass (me). 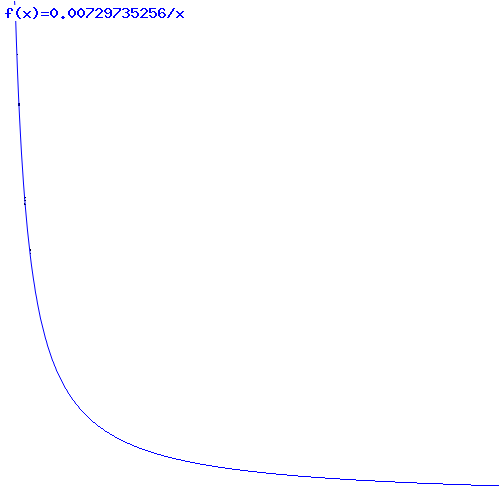 The fine-structure constant α, which is a dimensionless number. Planck’s constant h, whose dimension is joule·second, so that’s the dimension of action. The speed of light c, whose dimension is that of a velocity. This is an interesting expression. Let’s first check its dimension. We already explained that e2 is expressed in N·m2. That’s rather strange, because it means the dimension of e itself is N1/2·m: what’s the square root of a force of one newton? In fact, to interpret the formula above, it’s probably better to re-write e2 as e2 = qe2/4πε0 = ke·qe2. That shows you how the electron charge and Coulomb’s constant are related. Of course, they are part and parcel of one and the same force law: Coulomb’s law. We don’t need anything else, except for relativity theory, because we need to explain the magnetic force as well—and that we can do because magnetism is just a relativistic effect. Think of the field momentum indeed: the magnetic field comes into play only when we start to move our electron. The relativity effect is captured by c in that formula for α above. As for ħ, ħ = h/2π comes with the E = h·f equation, which links us to the electron’s Compton wavelength λ through the de Broglie relation λ = h/p. The point is: we should probably not look at α as a ‘fundamental physical constant’. It’s e2 that’s the third fundamental constant, besides h and c. Indeed, it’s from e2 that all the rest follows: the electron’s internal energy, its external energy, and its radius, and then all the rest by combining stuff with other stuff. Now, we took the magic out of α by doing what we did in the previous posts, and that’s to combine stuff with other stuff, and so now you may think I am putting the magic back in with that formula for α, which seems to define α in terms of the three mentioned ‘fundamental’ constants. That’s not the case: this relation comes out of all of the other relationships we found, and so it’s nothing new really. It’s actually not a definition of α: it just does what it does, and that’s to relate α to the ‘fundamental’ physical constants behind. Eelec = αe/r0: This is the formula for the energy of the field. Uelec = αu/r0: This is the energy needed to assemble our electron. Both energies are determined by the above-mentioned laws, i.e. Coulomb’s Law and the theory of relativity, so α has got nothing to do what that. However, both energies have to be the same, and so αe has to be equal to αu. In that sense, α is, quite simply, a proportionality constant that achieves that equality. Now that explains why we can derive α from the three other constants which, as mentioned above, are probably more fundamental. In fact, we’ve got only three degrees of freedom here, so if we chose c, h and e as ‘fundamental’, then α isn’t any more. The underlying deep question behind it all is why those two energies should be equal. Why would our electron have some internal energy if it’s elementary? The answer to that question is: because it has some non-zero radius, and it has some non-zero radius because we don’t want our formula for the field energy (or the field momentum) to blow up. Now, if it has some radius, then it has to have some internal energy. You’ll say: that makes sense, but it doesn’t answer the question. Why would it have internal energy, with or without a zero radius? If an electron is an elementary particle, then it’s really elementary, isn’t? And so then we shouldn’t try to ‘assemble’ it from an infinite number of infinitesimally small charges. You’re right, and here we can also note that the fact that the electron doesn’t blow up is firm evidence it’s very elementary indeed. I should also note that Feynman actually doesn’t talk about the energy that’s needed to assemble a charge: he gets his Uelec = (1/2)·(e2/a) by calculating the external field energy for a spherical shell of charge, and he sticks to it—presumably because it’s the same field for a uniform or non-uniform sphere of charge. He only notes there has to be some radius because, if not, the formula he uses blows up, indeed. So – who knows? – perhaps he doesn’t quite believe that formula for the internal energy is relevant either. So perhaps there is no internal energy indeed. Perhaps there’s just the energy of the field. So… Well… I can’t say much about this… Except… Well… Perhaps just one more thing. Let me note something that, I hope, you noticed as well: the ke·qe2 is the numerator in Coulomb’s Law itself. You also know that energy equals force times distance. So if we divide both sides by r0, we get Coulomb’s Law itself Felec = ke·qe2/r02. The only thing is: what’s the distance? It’s one charge only, and there is no distance between one charge, is there? Well… Yes and no. I have been thinking that the requirement of the internal and external energies being equal resembles the statement that the forces between two charges are equal and opposite. That ties in with the idea of the internal energy itself: remember we were basically talking forces between infinitesimally small elements of charge within the electron itself? So r0 is, perhaps, some average distance or so. There must be some way of thinking of it like that. But… Well… Which one exactly? When calculating the radius of an electron using classical theory, we get in trouble: not only do we find different radii, but the radii that we find do not respect the E = mec2 law. It’s only the mec2 = e2/r0 that’s relativistically correct. That suggests the electron also has some non-electric mass, which are referred to as ‘binding forces’ or ‘Poincaré stresses’, but which remain to be explained convincingly.